Consumers are uneasy about digital transactions. This is evident by the fact that identity theft is one of the top three consumer complaints to the Federal Trade Commission every year for more than 15 years. Your website is your business, your brand, and perhaps your bread and butter. If it’s not protected, then critical business relationships are at risk, especially your number one asset, your customer. The more a small business can do to protect it’s website, the more customers are likely to visit, shop, and return. A single security breach could mean the end of a small business. So isn’t it time you took control of your website security? There are certain areas within every website, such as Contact Forms, Login Pages, etc. that allow user input, which are extremely vulnerable and therefore should be protected appropriately. The process of identifying such grey areas within websites and securing them is usually known as web application penetration testing. The security experts that perform these tests are known as penetration testers. Penetration testing is the best way to test the actual effectiveness of your security. However, penetration testing can cost thousands of dollars and may not be a viable option for small businesses. 9) Testing against popular website attacks like BruteForce, DDOS (Distributed Denial of Service), SQL Injection, and Cross-Site Scripting (XSS). To get started with checking your website’s security without getting too technical, you can make use of website scanning tools. These website security or scanning tools usually scan your websites within a matter of minutes and present comprehensive reports. A website security checking tool – or website virus checker – help you assess your website’s security status so that you can take appropriate security measures. 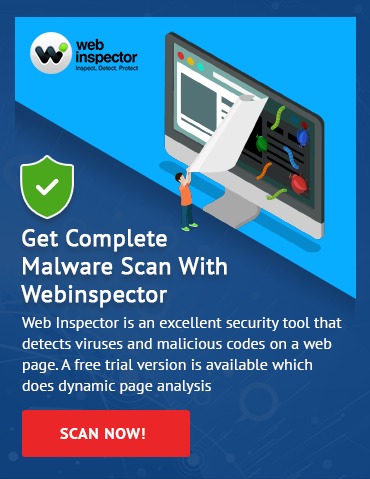 One such tool, Web Inspector, comes equipped with impressive website security testing features like Daily Malware Scanning, Blacklist Monitoring, and Threat Notifications. These features make it one of the most powerful website virus checker in the security market. Fortunately for small business owners, this service is free. Start protecting your business today before it’s too late. Check your website’s security by using Web Inspector here. What is HTTPS | Difference between HTTP and HTTPS | How its Work? What is HTTPS? Website Security Website Malware Removal cWatch Pro - Website Security Solution Top 10 Pirated Bay Torrent Sites 2018 How to Check Website Security? cWatch provides comprehensivee, cloud-based website security solutions for business of all sizes against threats.